A Possum carrying four babies on her back was in our backyard about 9:00 a.m. this morning. We live in a subdivision with fairly small yards, but there is a small ravine about four blocks away. Our yard is fenced with a wooden fence except for gate at front of yard. Wondered how the Possum got around carrying four babies on her back. 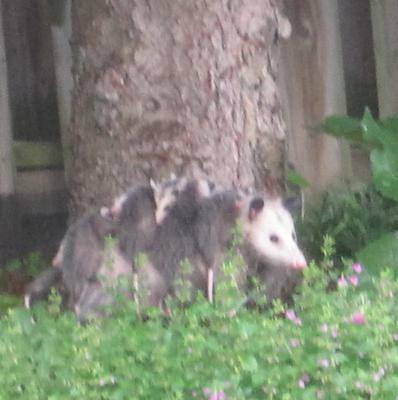 Thank you for telling us about your Possum sighting, and for sending us your picture of Mamma Possum with her babies! Actually, think there were about eight babies. There seems to be more than 4 babies here. So cute! I've seen a couple here in Whitby since the summer months. That is an incredible shot! I guess on a daily basis we don't think about how the wild animals function around us. This picture certainly allows us a view into their world. Way to take advantage of an awesome photo opportunity AG! Gloria, timing is everthing, you were in the right place at the right time! Great photo! Good for you! Gloria's patience and quietness certainly helped here in capturing this great picture. Congrats! Thanks to Gloria for capturing and sharing the picture of a mother possum carrying her babies. What a beauty? I am encouraged to do the same whenever I see anything so natural and beautiful.